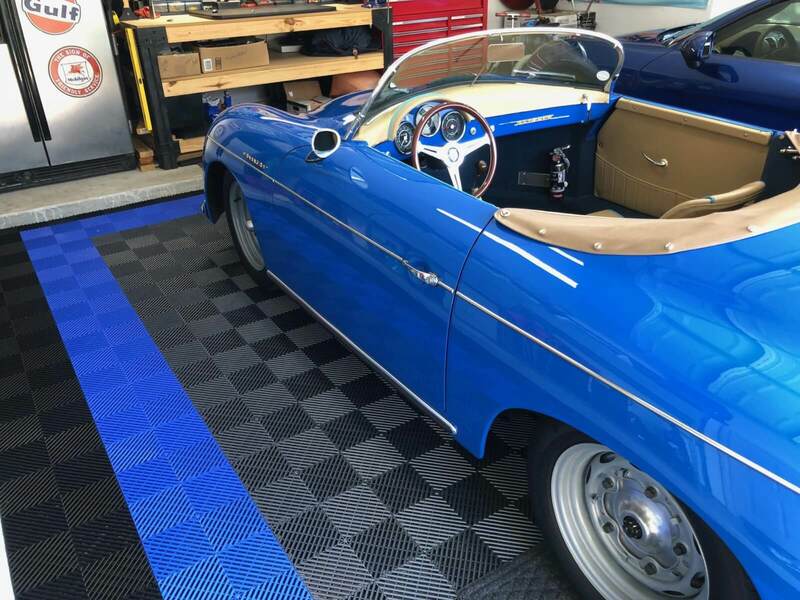 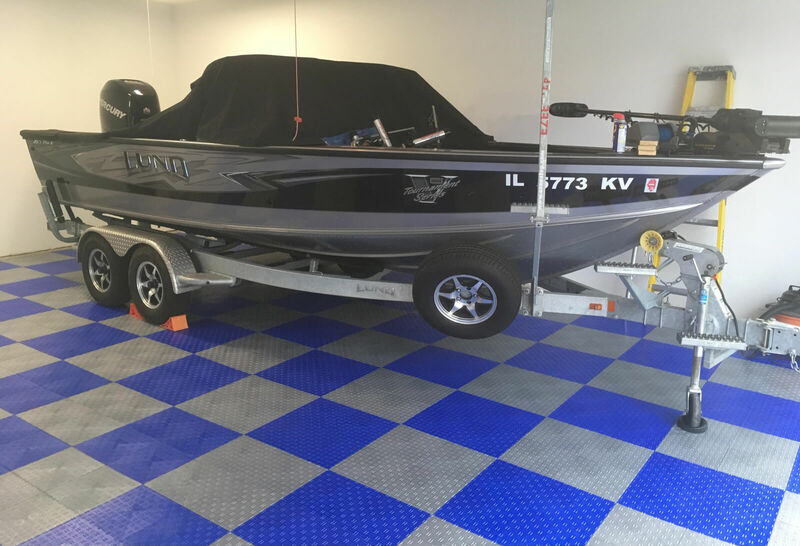 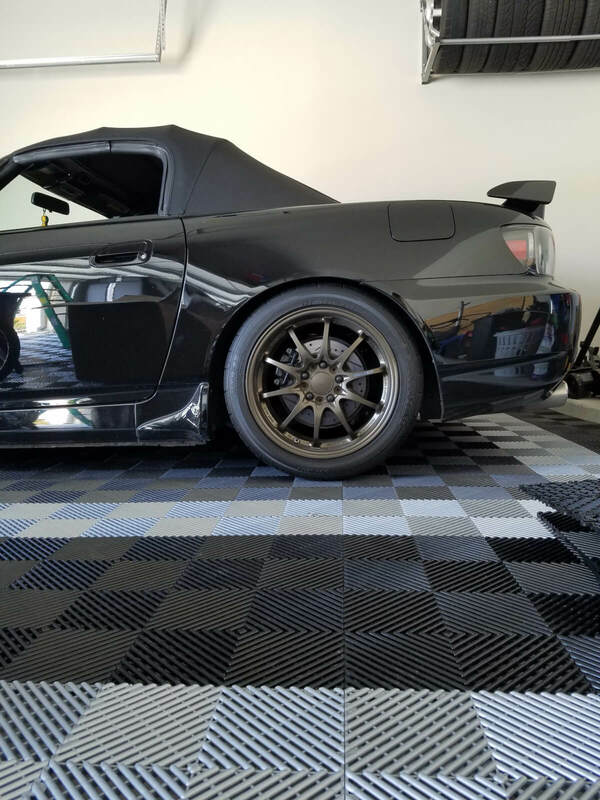 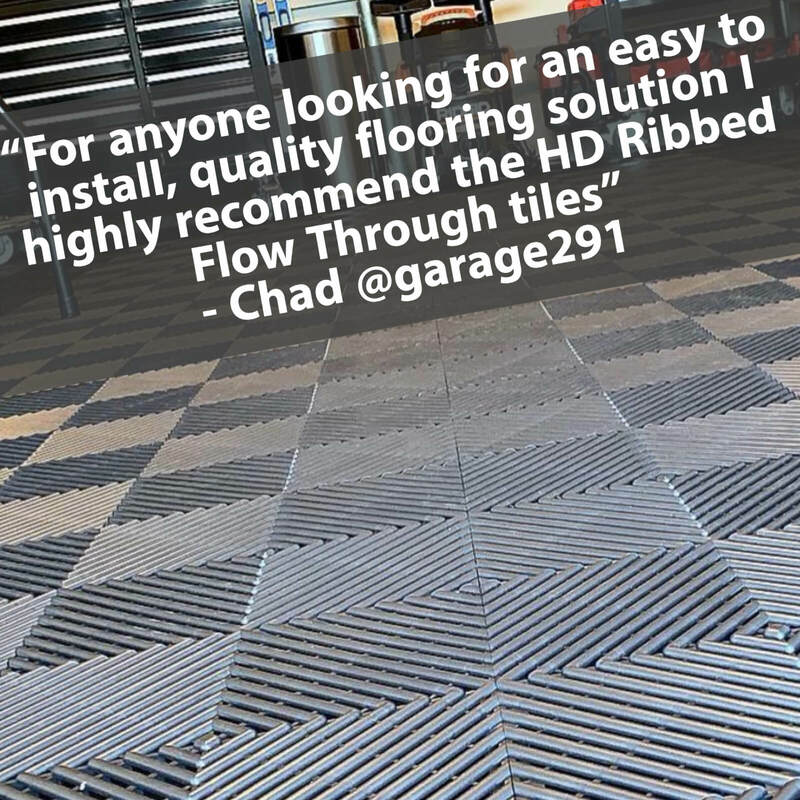 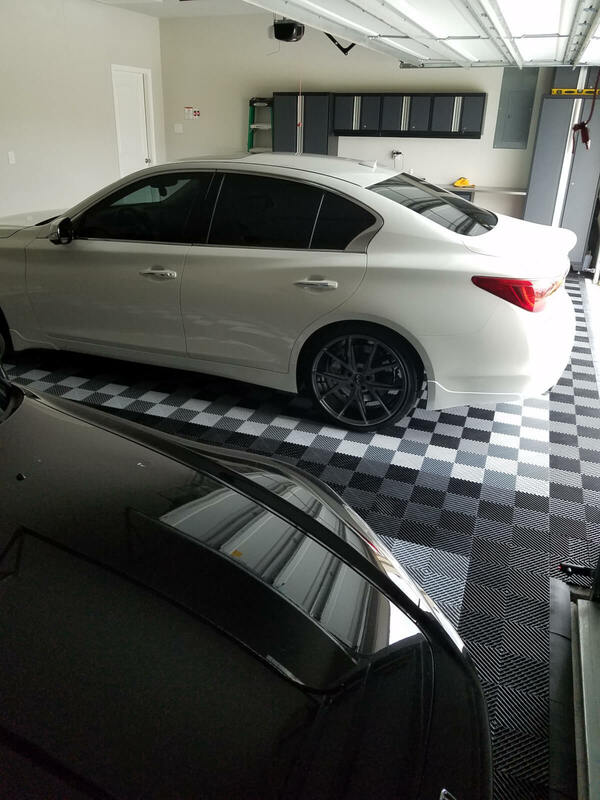 One of the newest products to come out is the BLT G-FLoor imaged Checkerboard garage floor mats which are also available in an epoxy look. 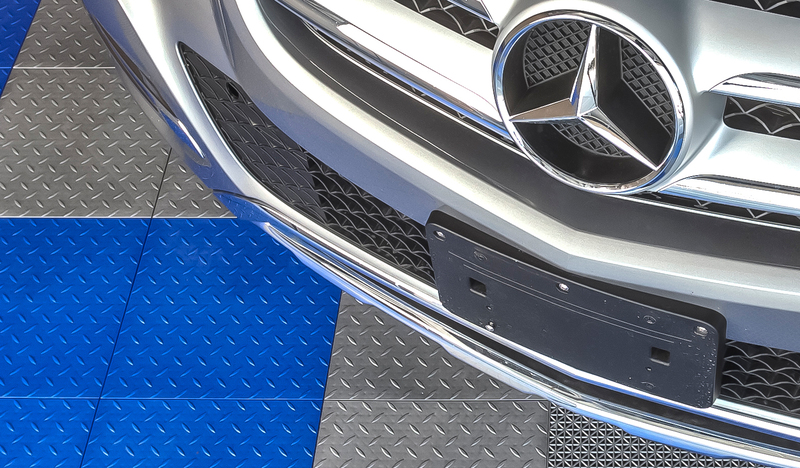 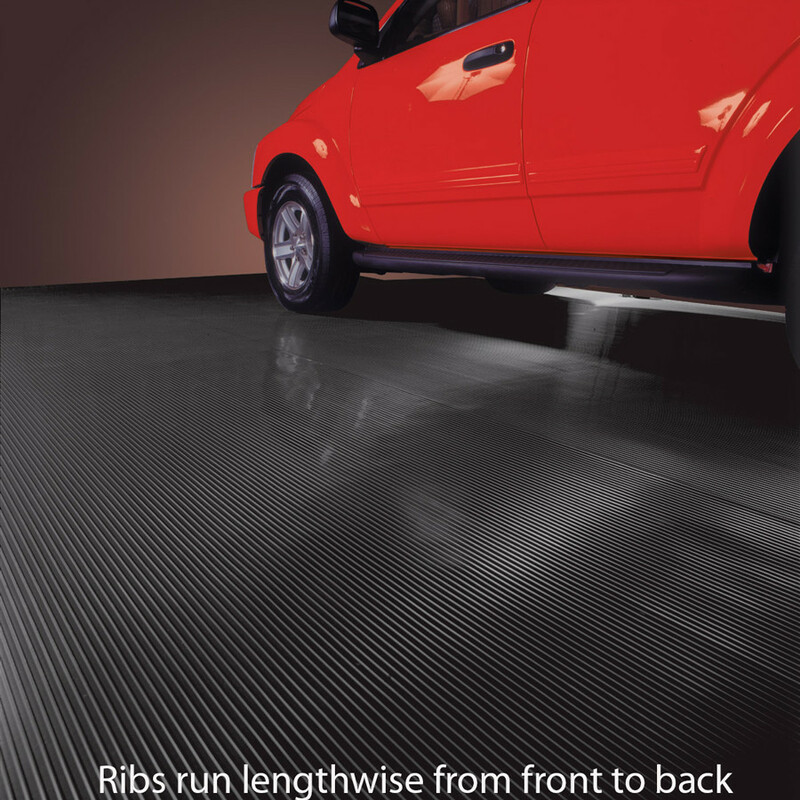 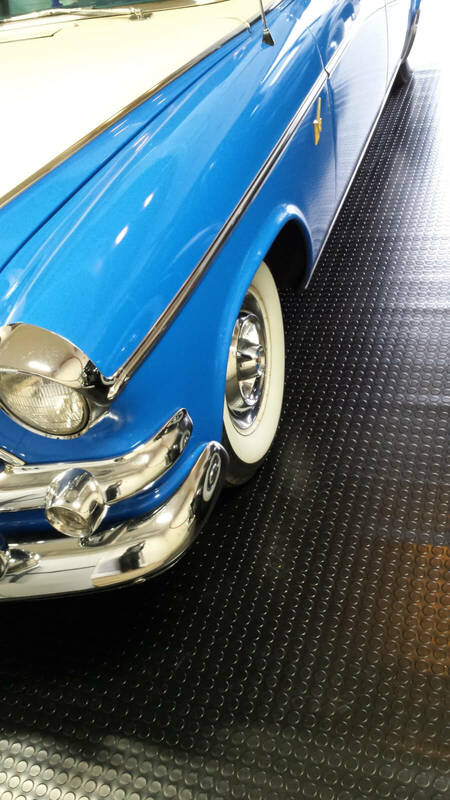 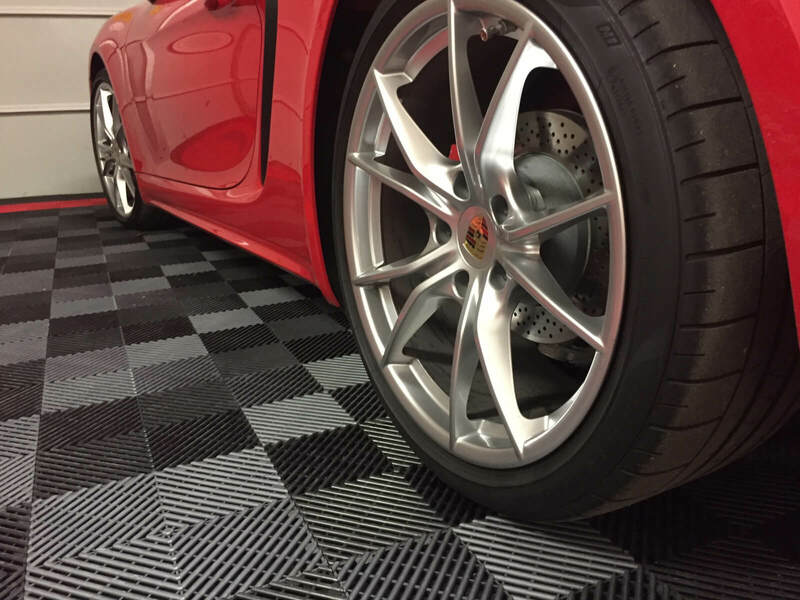 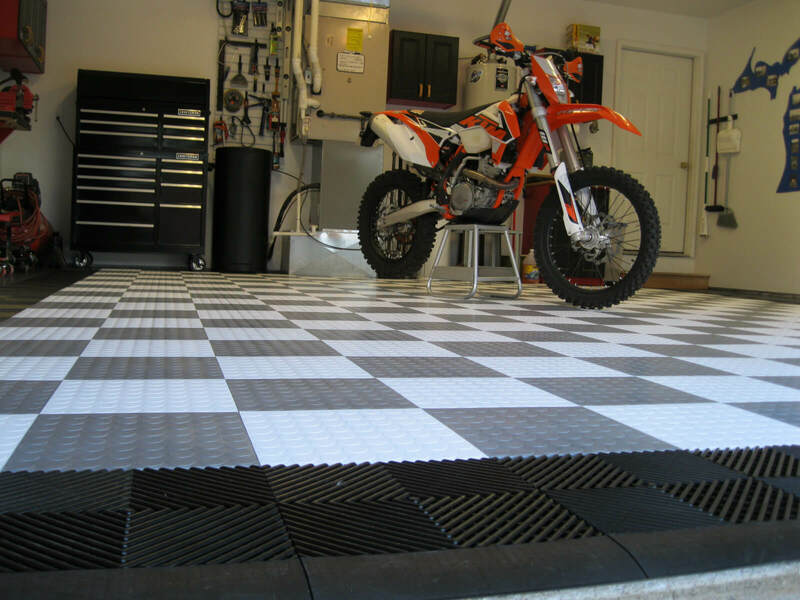 Unlike garage floor tile, these mats come in single sheets up to 10′ wide. 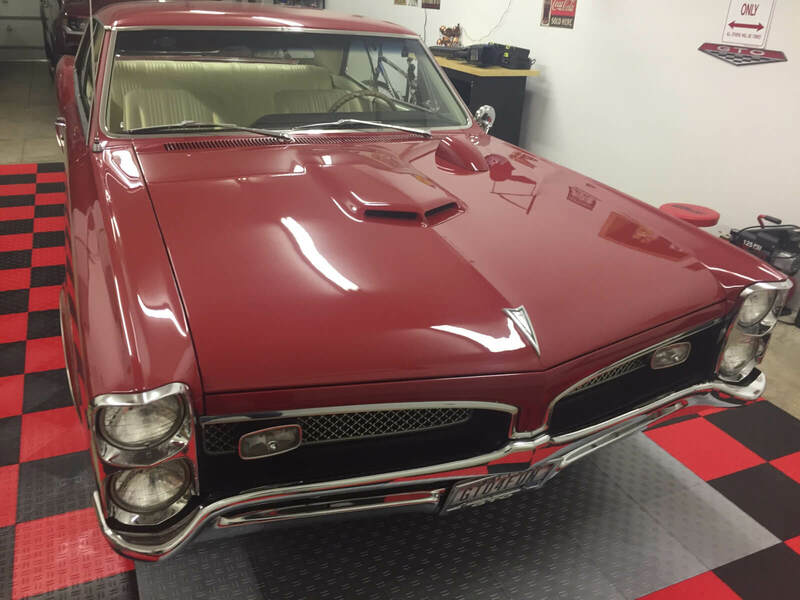 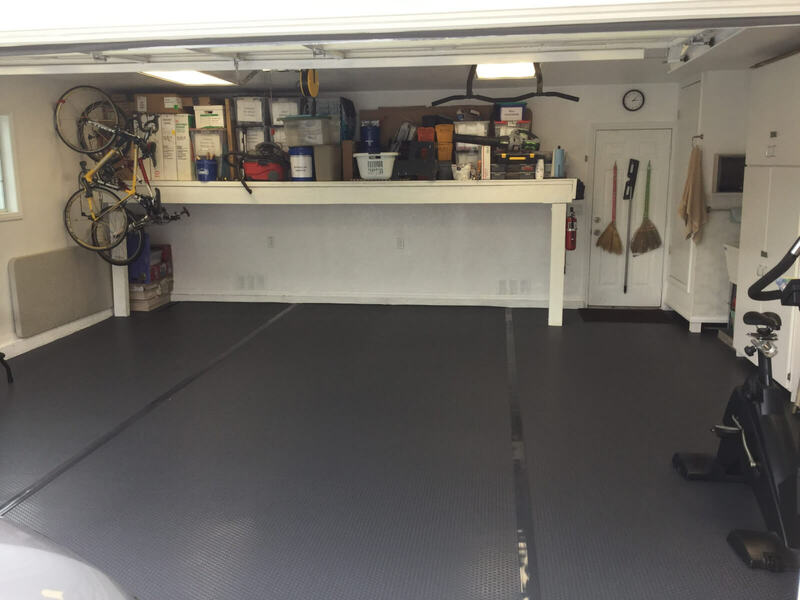 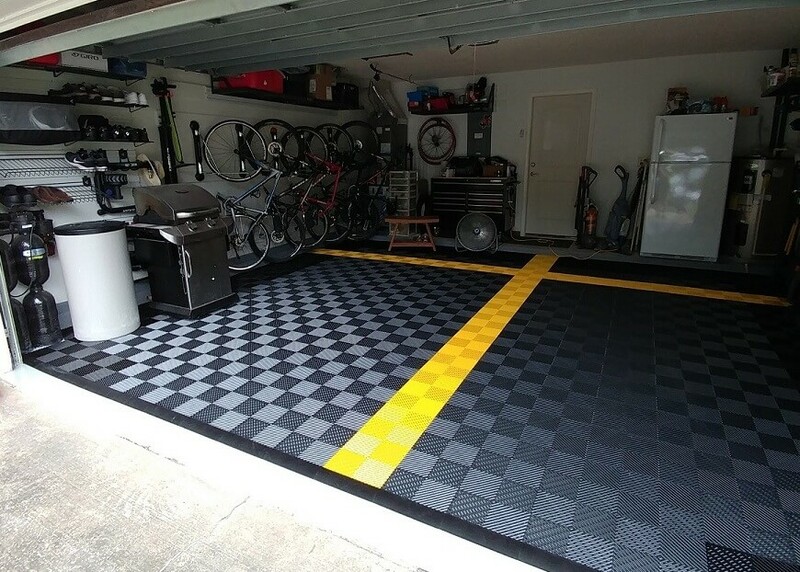 Two or more mats can be seamed together to cover larger garage areas. 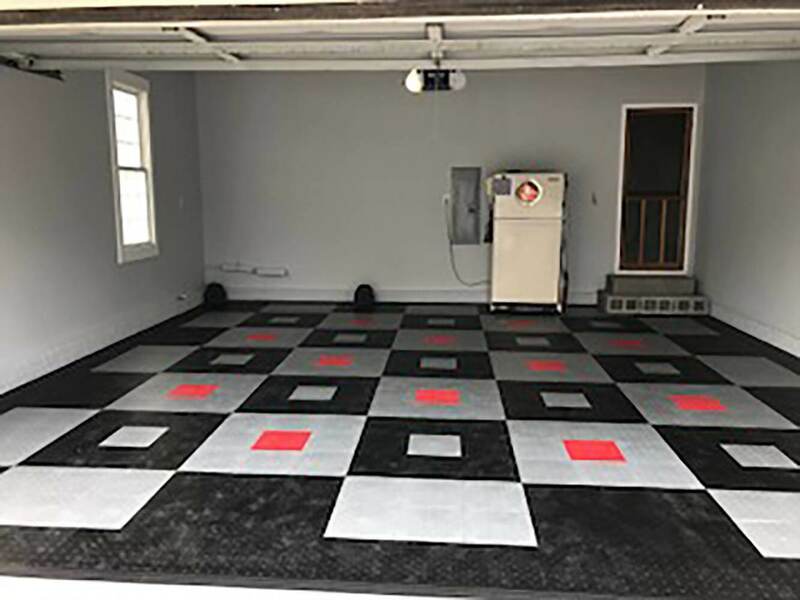 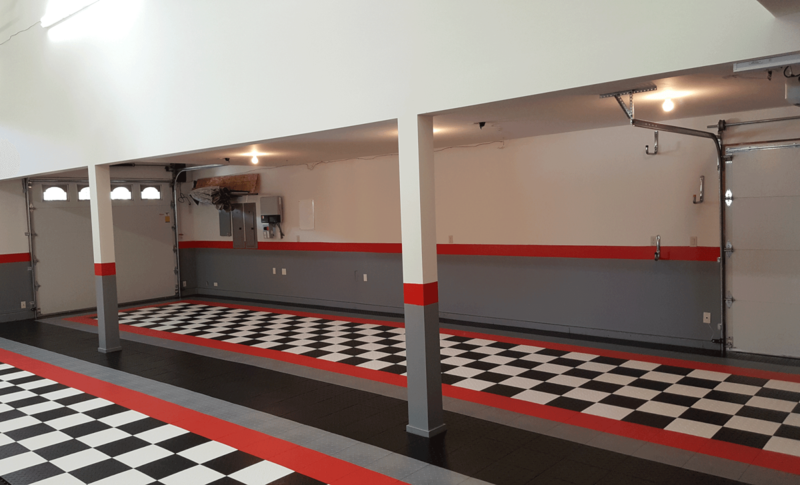 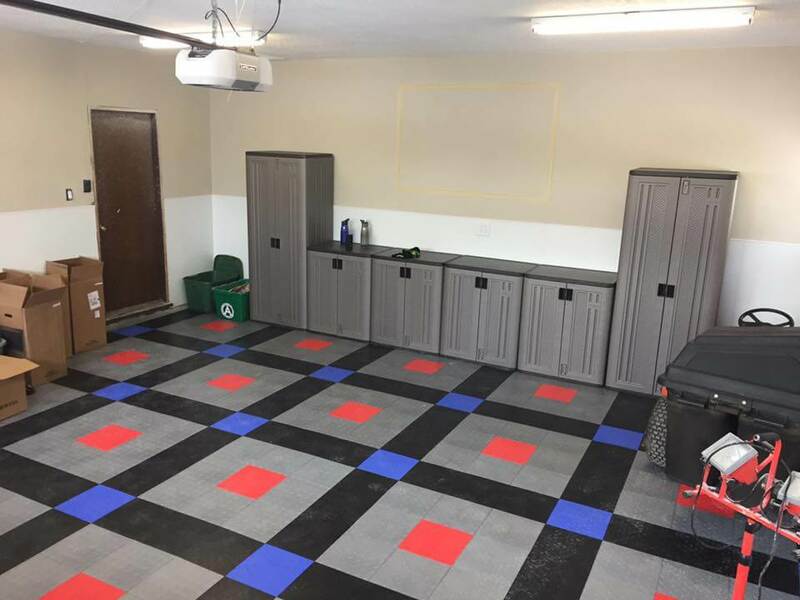 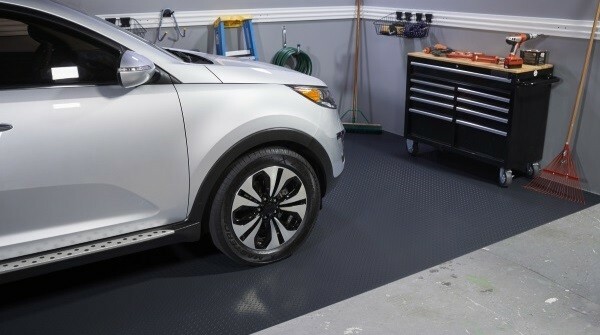 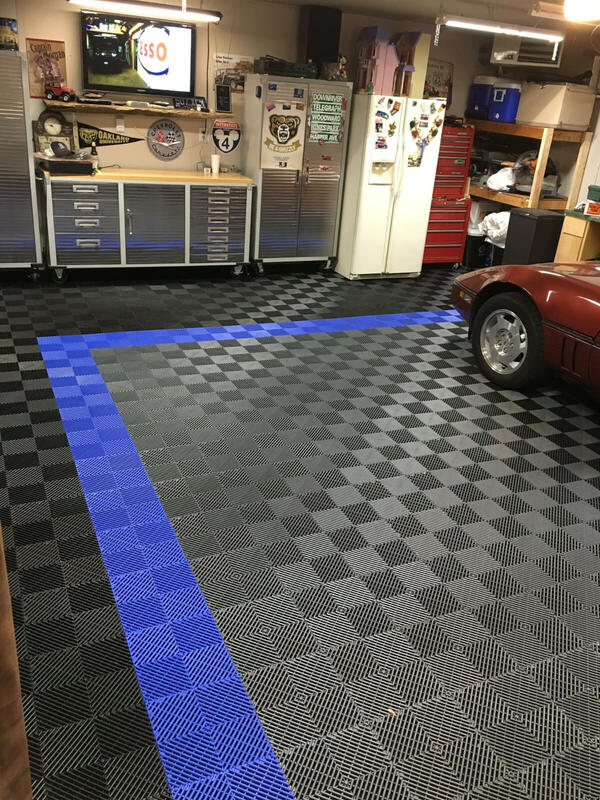 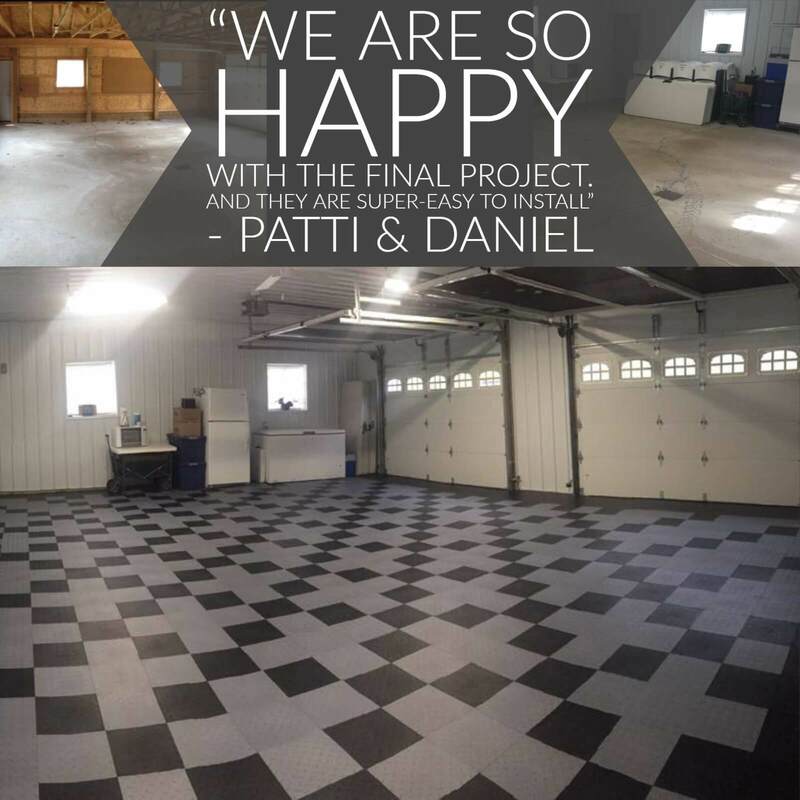 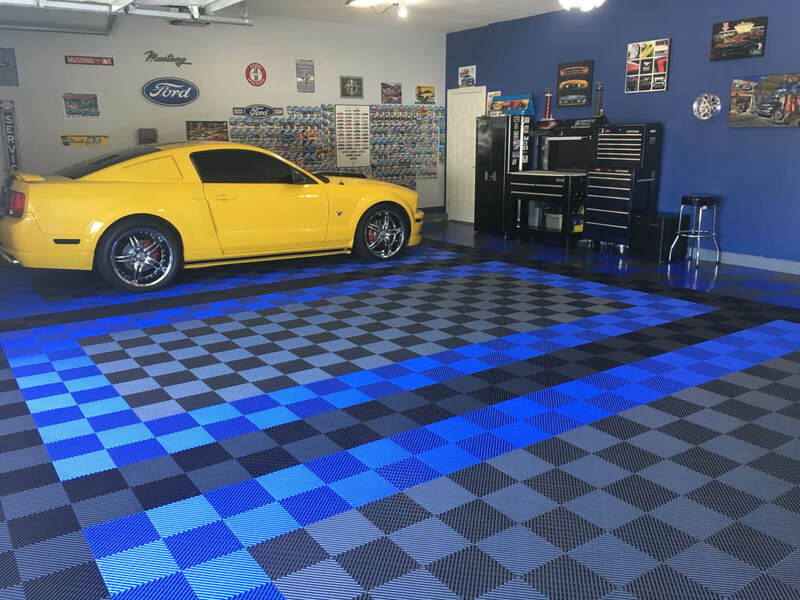 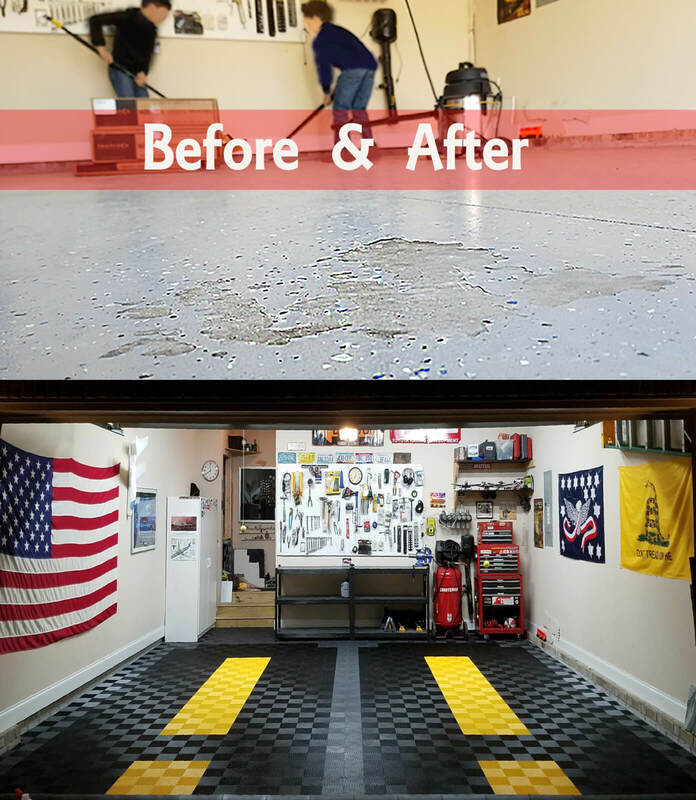 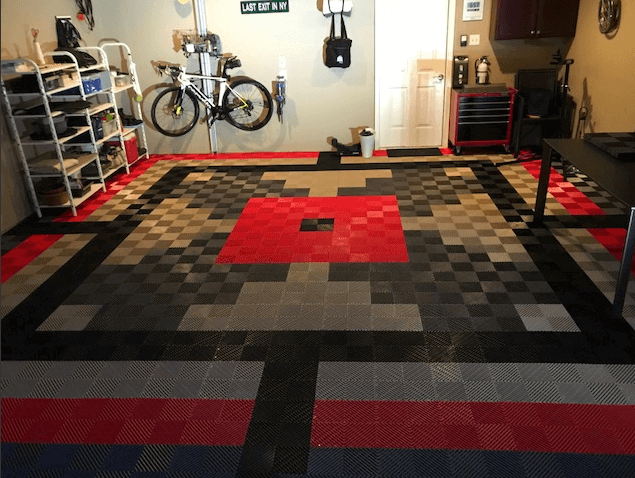 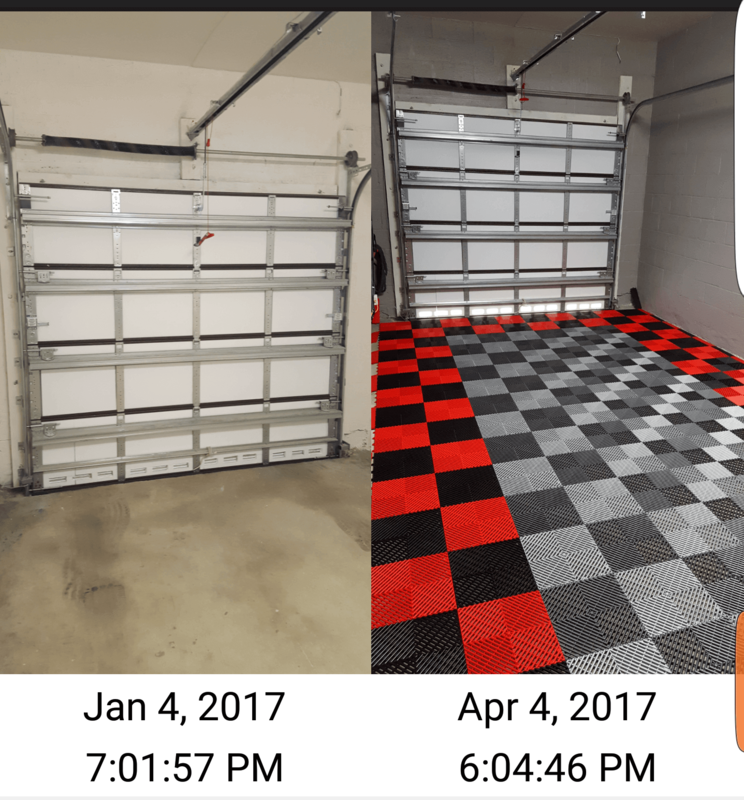 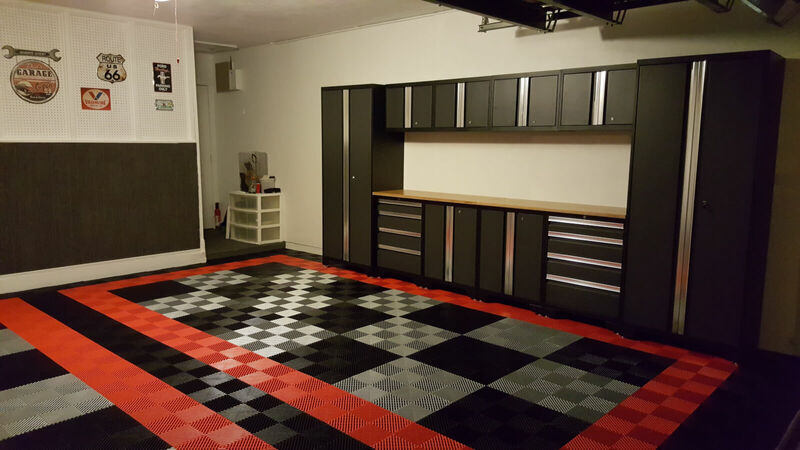 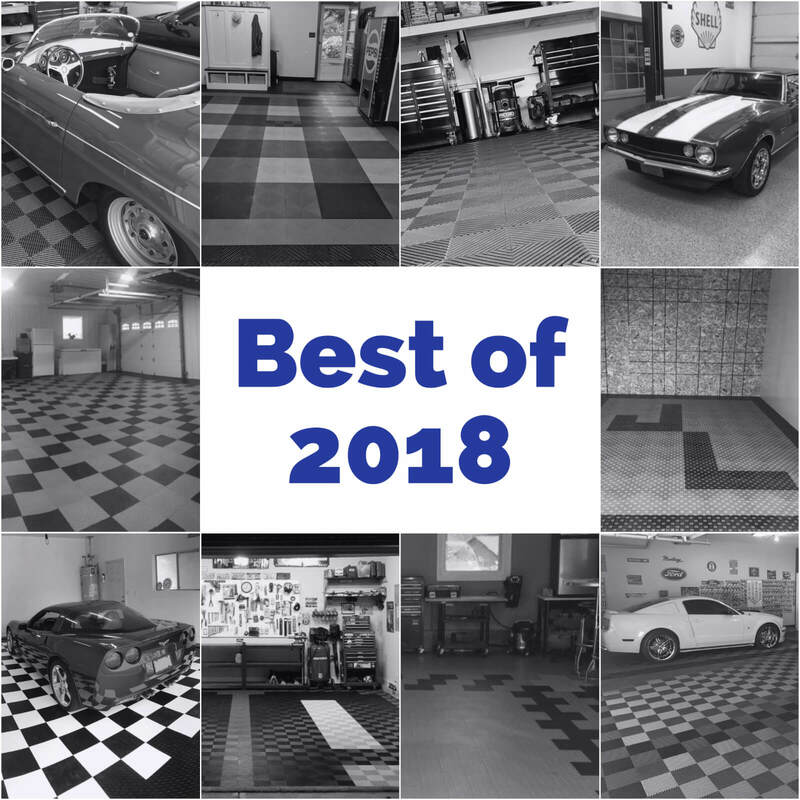 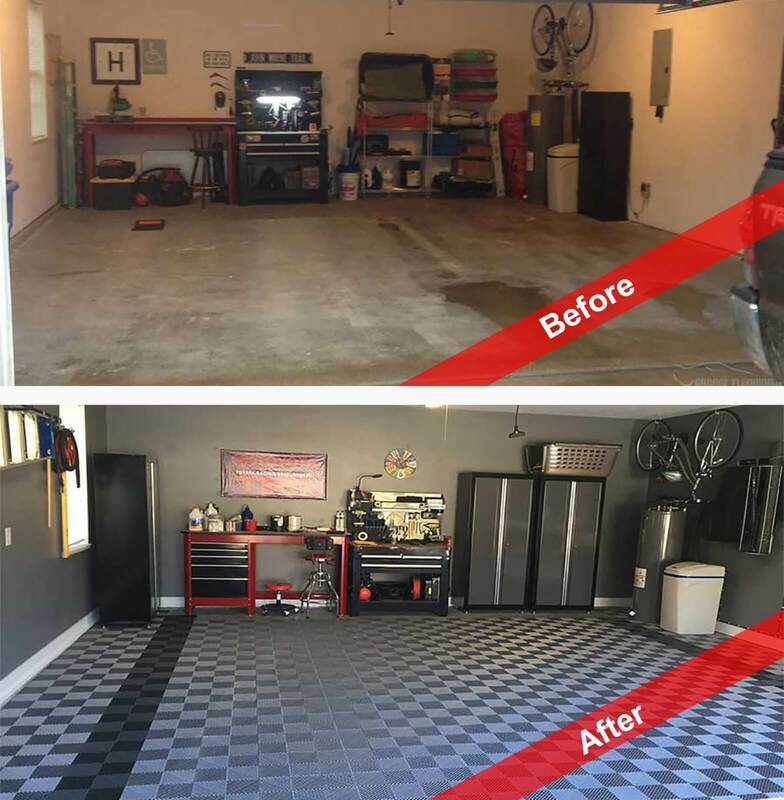 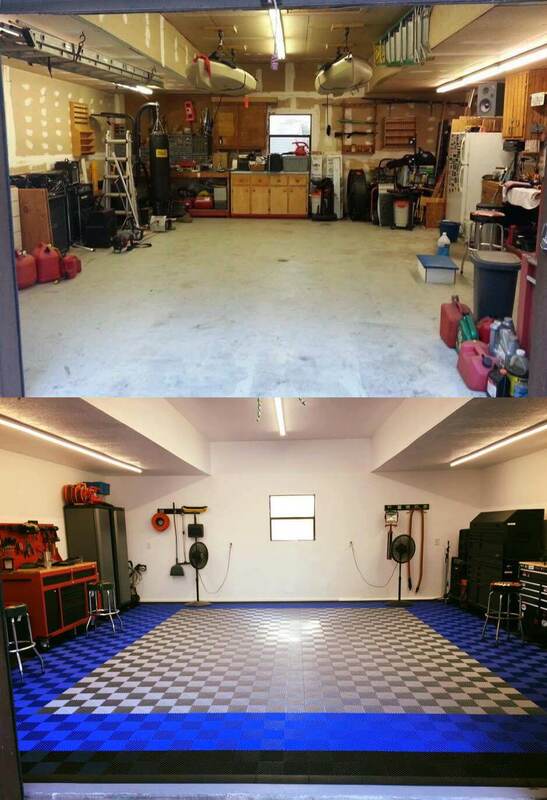 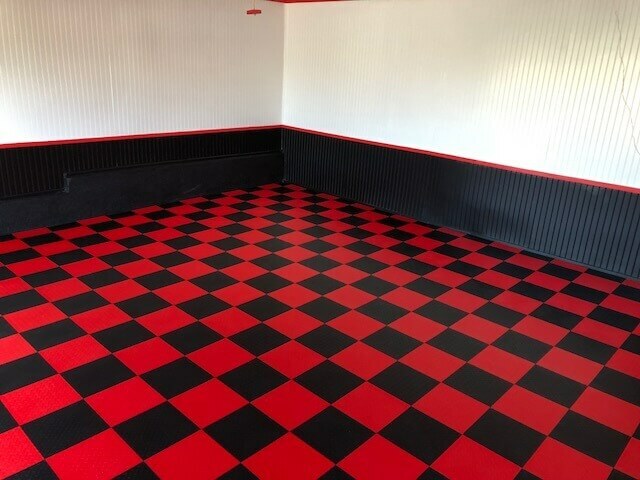 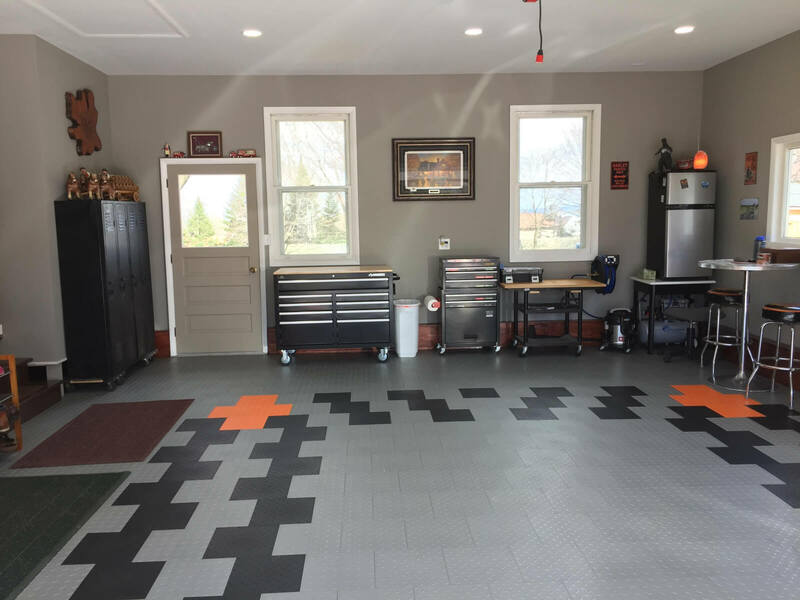 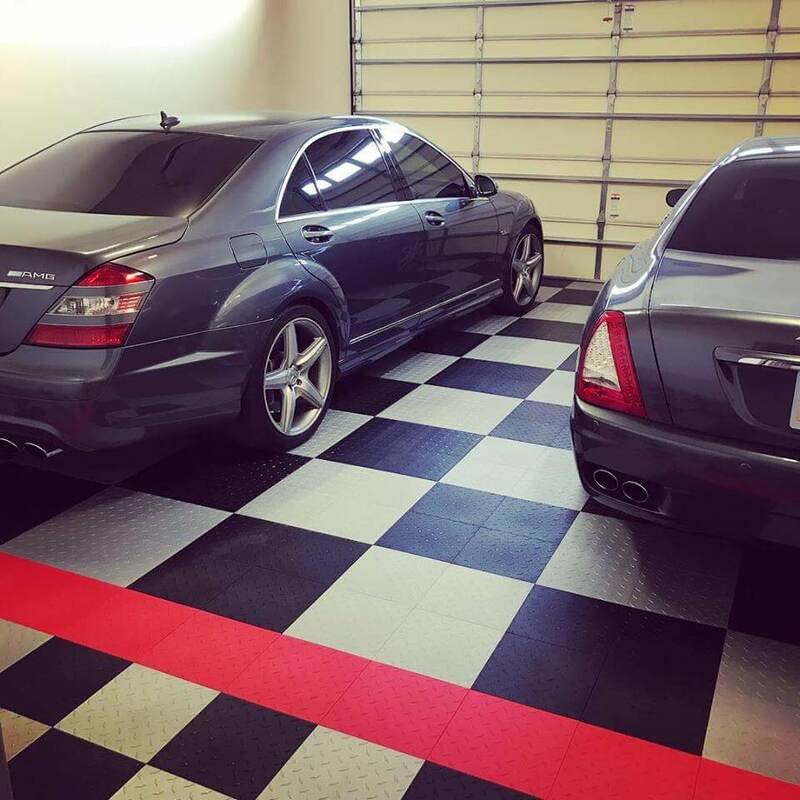 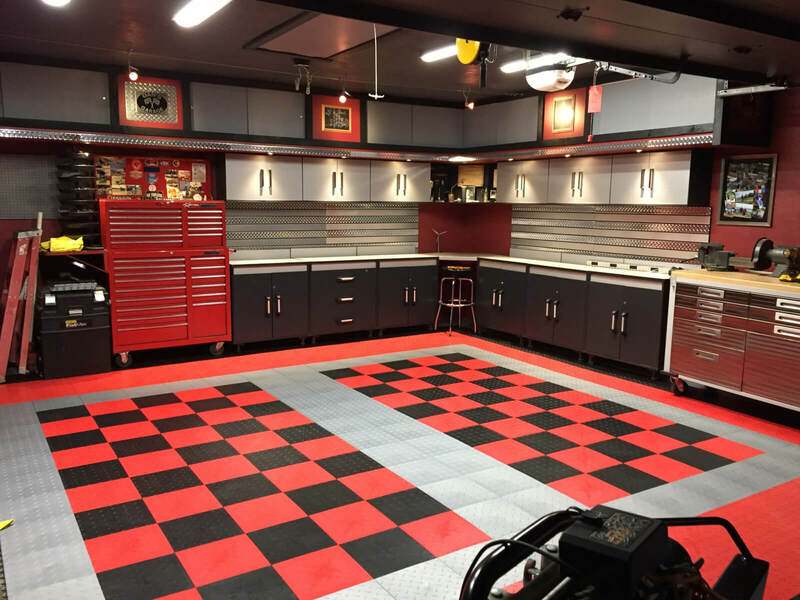 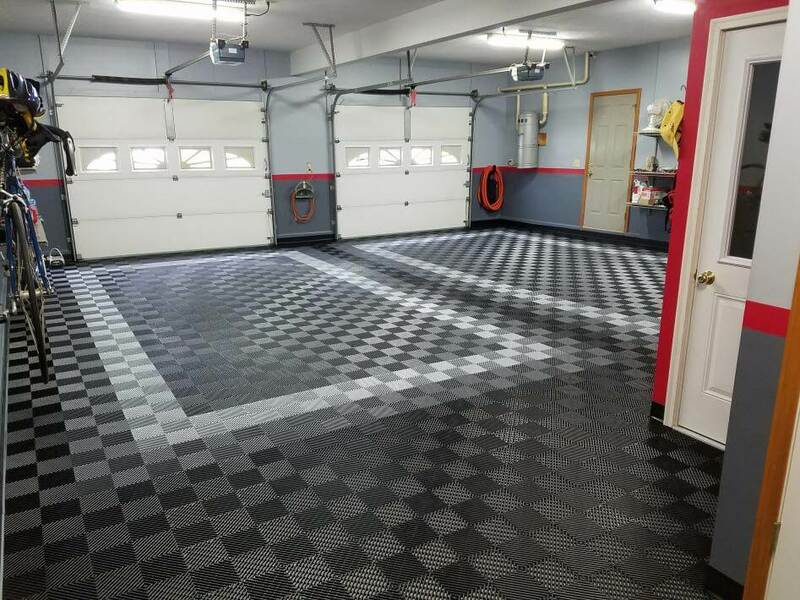 Garage flooring tile is perhaps the most affordable and least expensive way to create a checkerboard look in your garage. 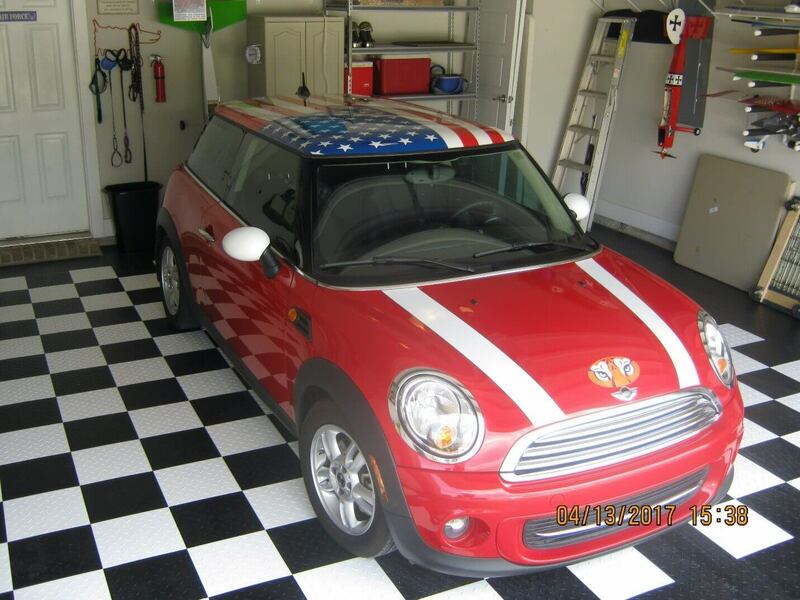 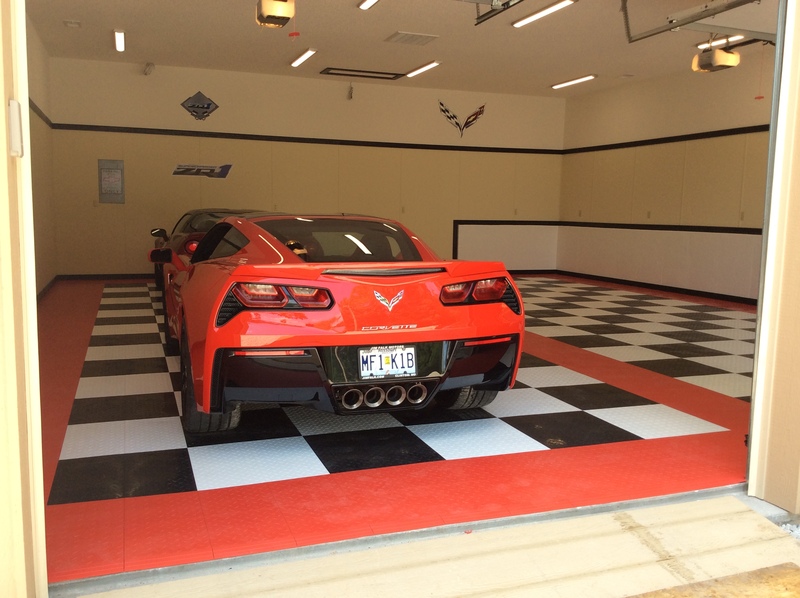 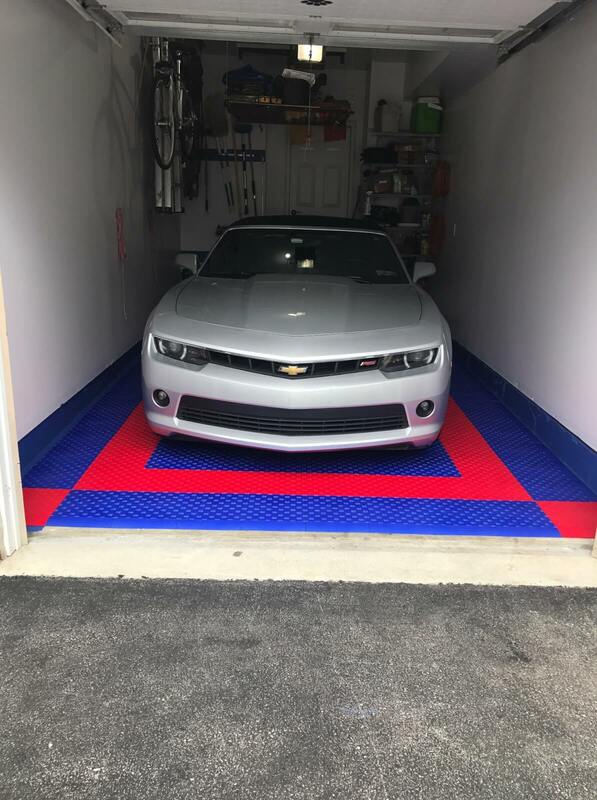 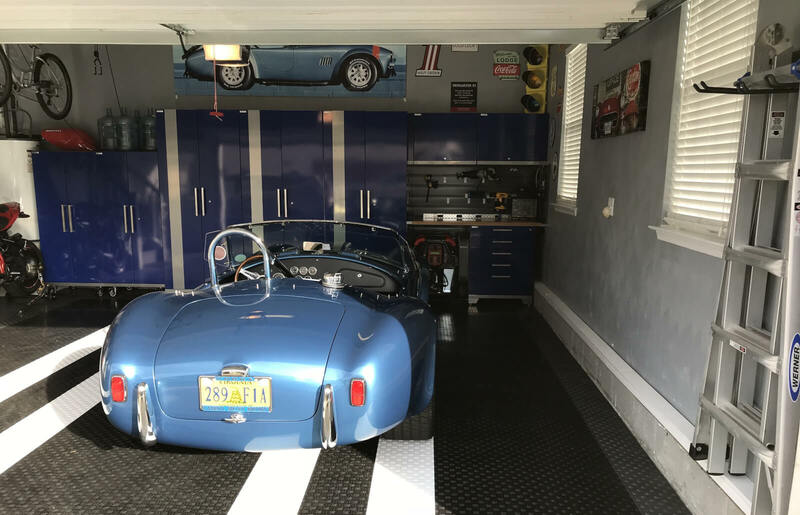 Starting around $3 a square foot, garage floor tiles simply snap together to create that racing flag look. 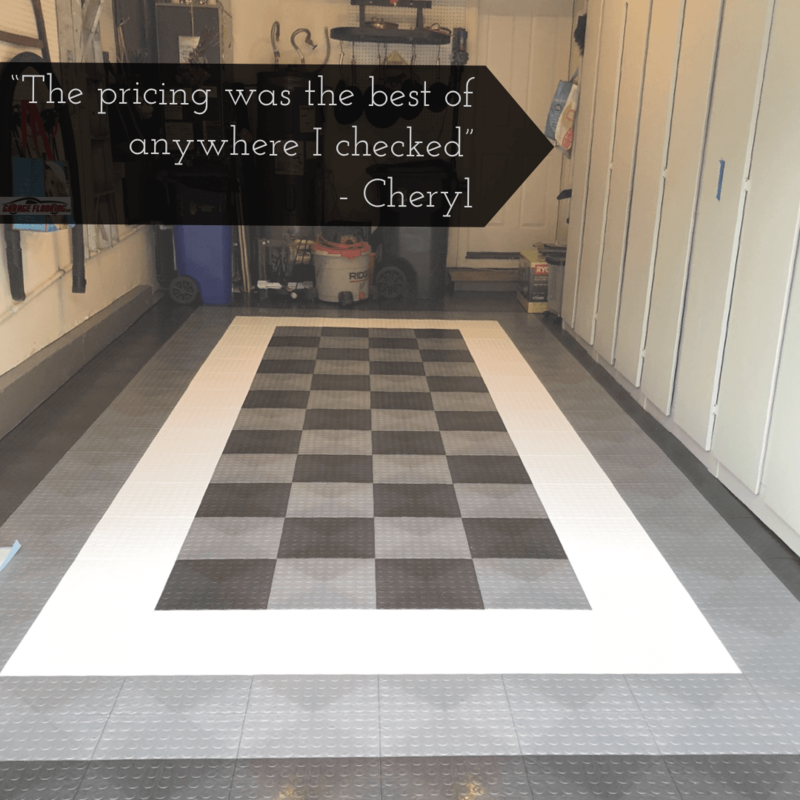 If you decide to go with black and white in your floor design, we would like to suggest that you do so with caution. 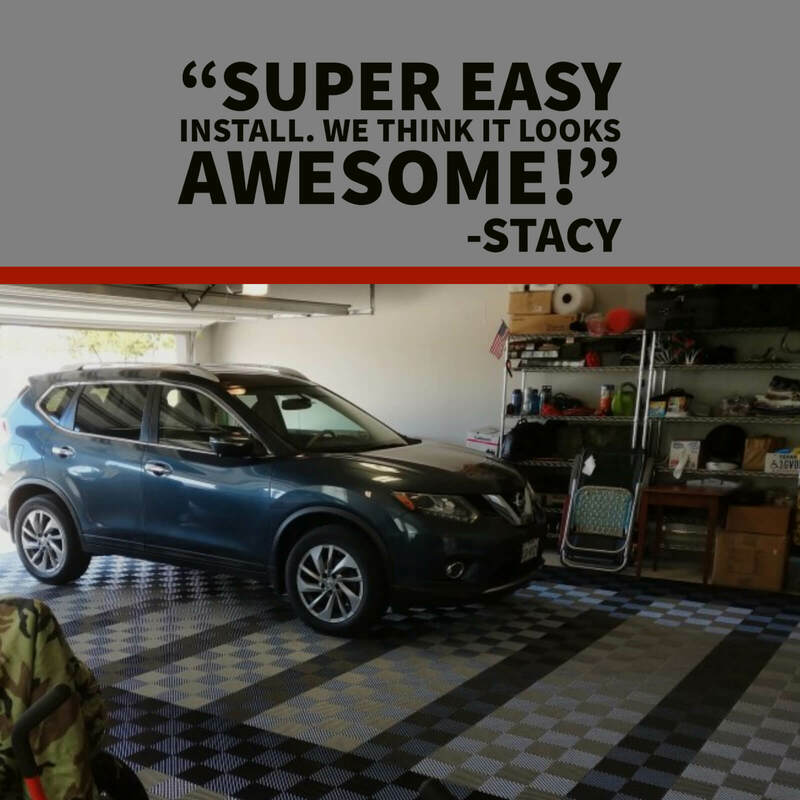 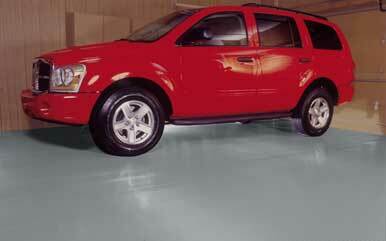 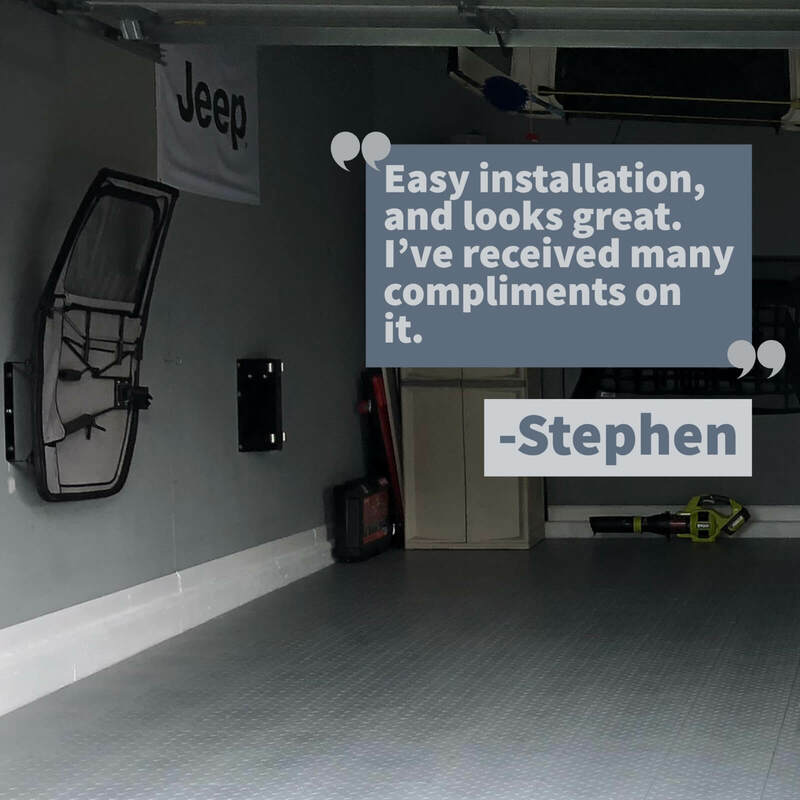 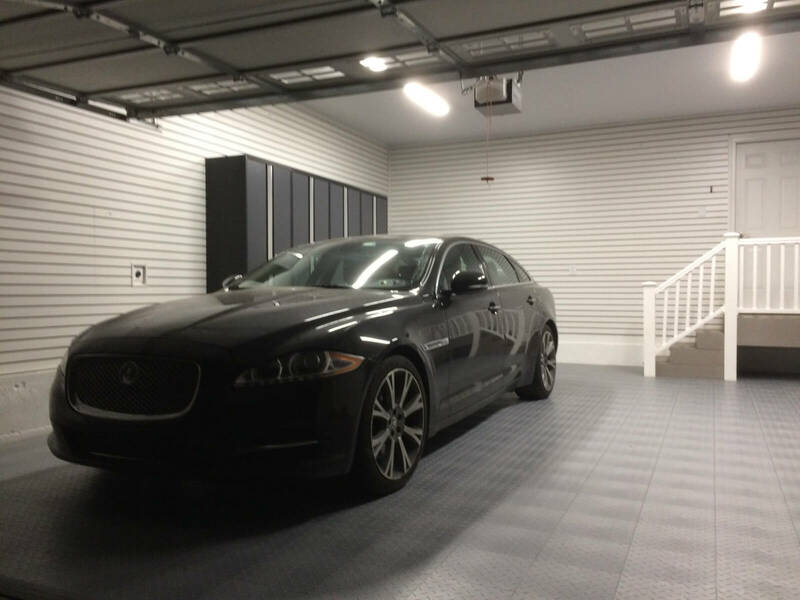 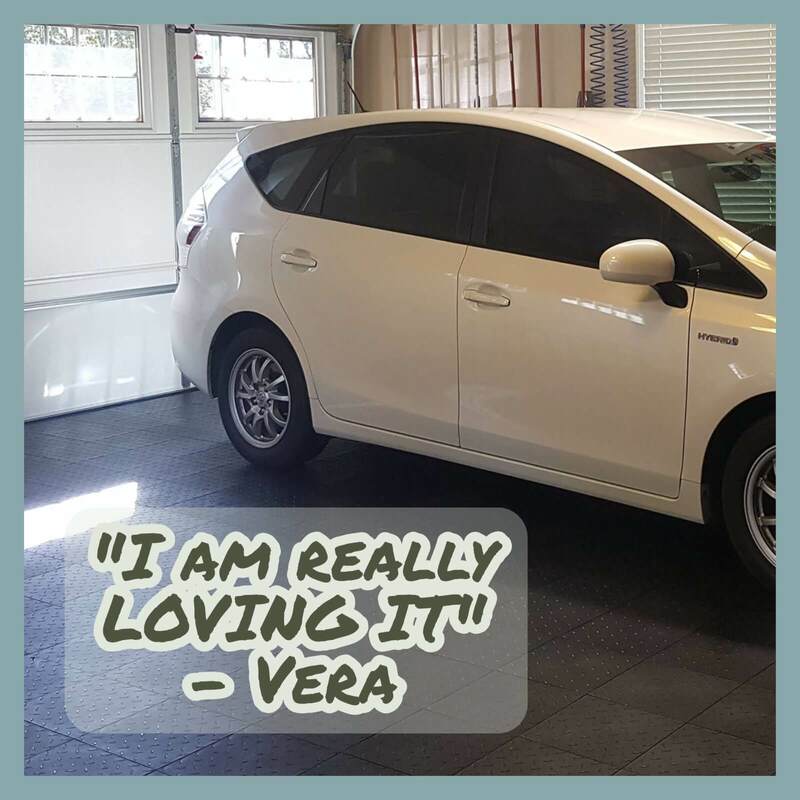 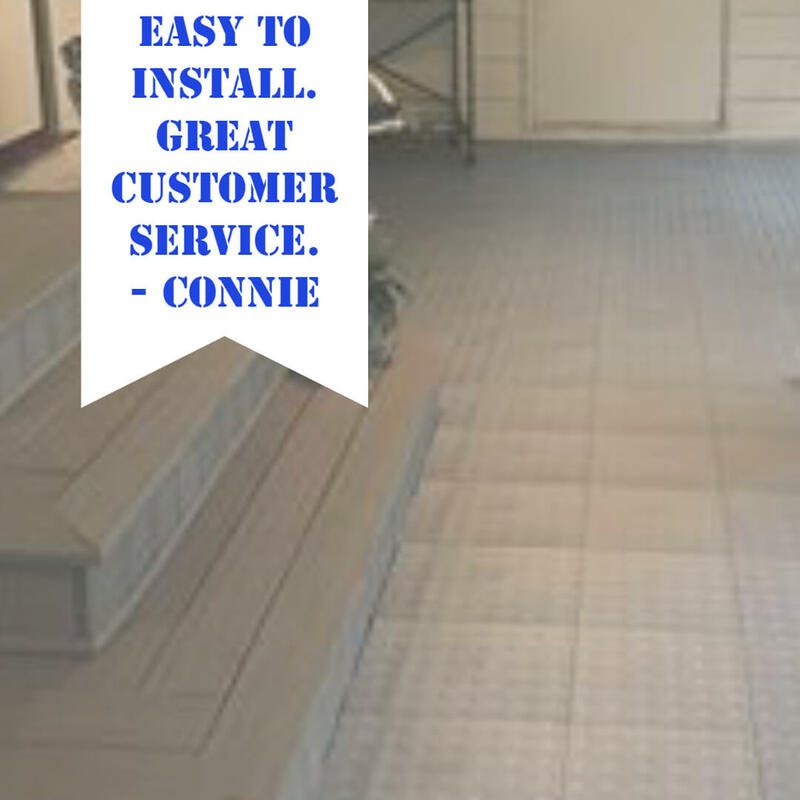 Our premium garage floor tile are guaranteed not to stain. 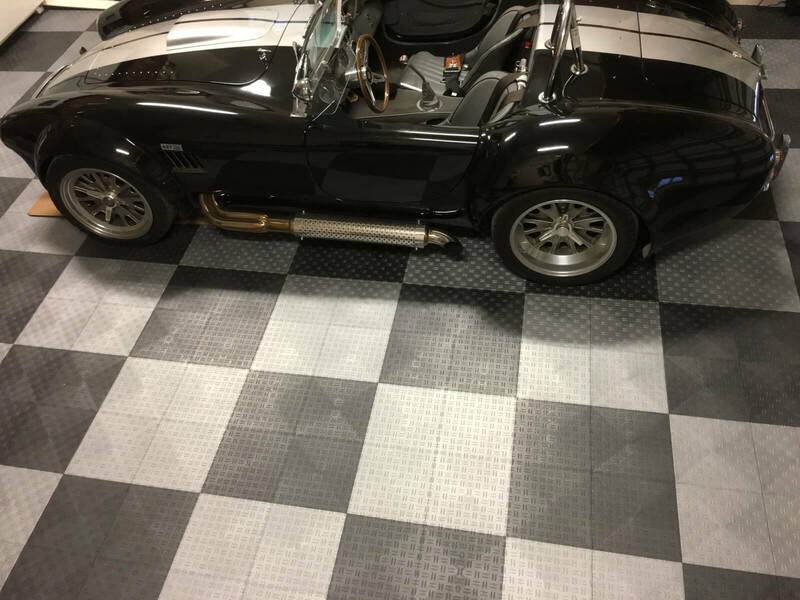 That said, most tiles will and regardless of staining, white tiles are like white T Shirts… They never look clean except when they are new! 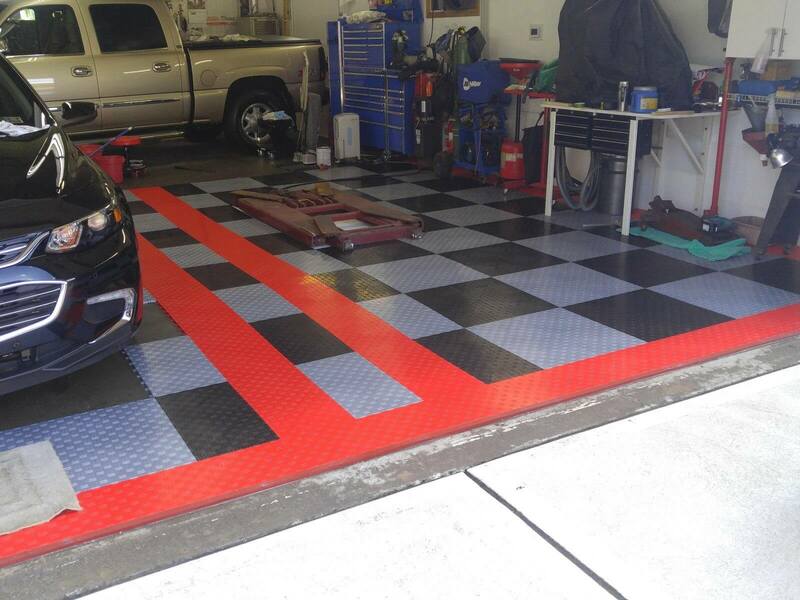 PVC tile for your garage can also give that checkerboard look. 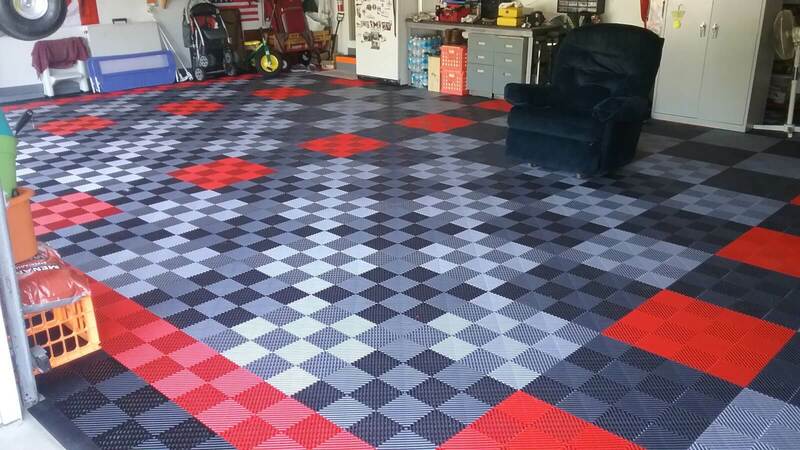 Unlike the traditional snap together tile they will give you more of a puzzle look on your floor. 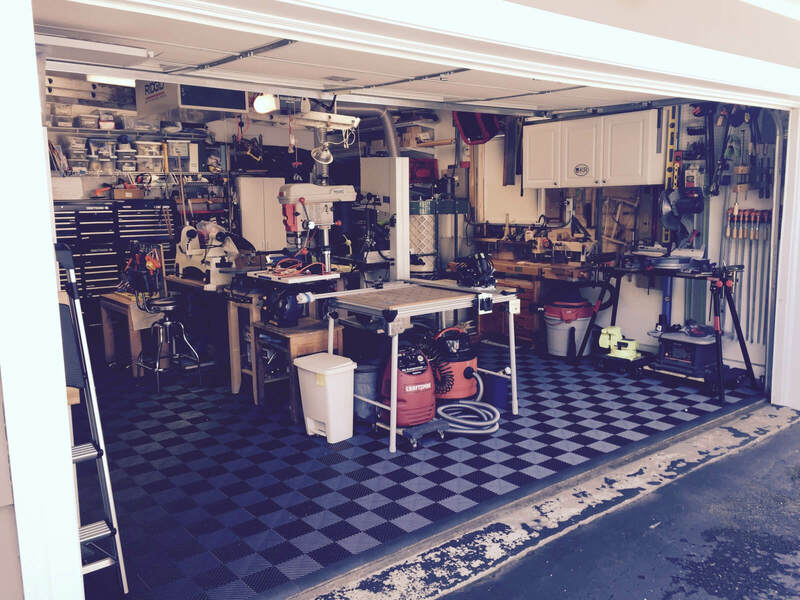 They use a T Lock or dovetail lock so you do not have the perfect square edges. 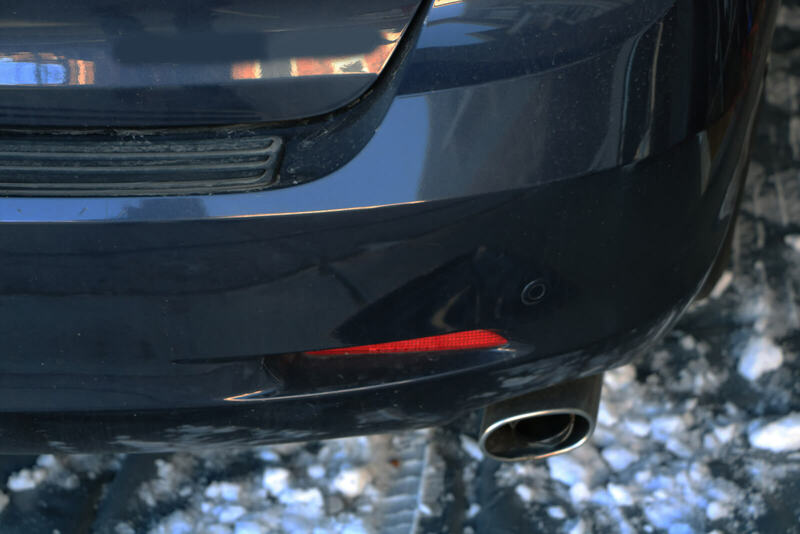 On the upside, their lock is much tighter and keeps moisture from getting through. 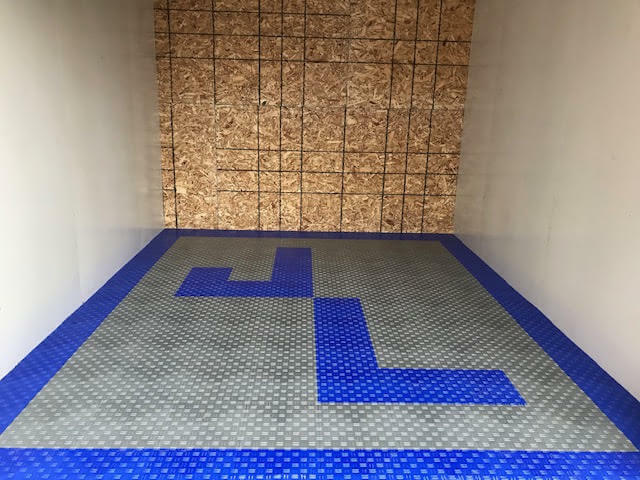 Despite the fact that they are not approved for garage application, VCT tile is still widely used. 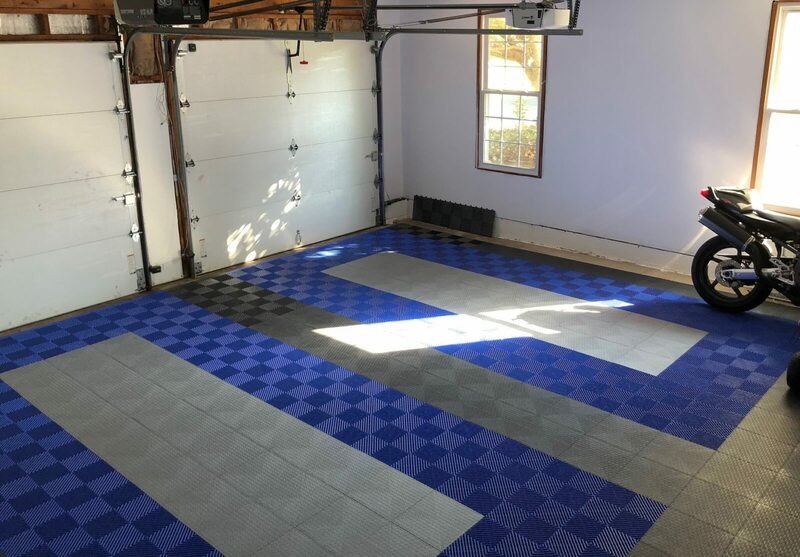 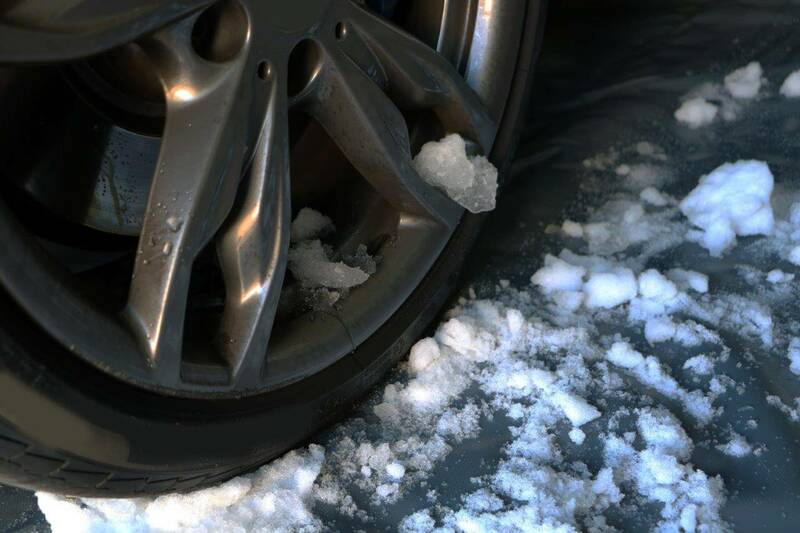 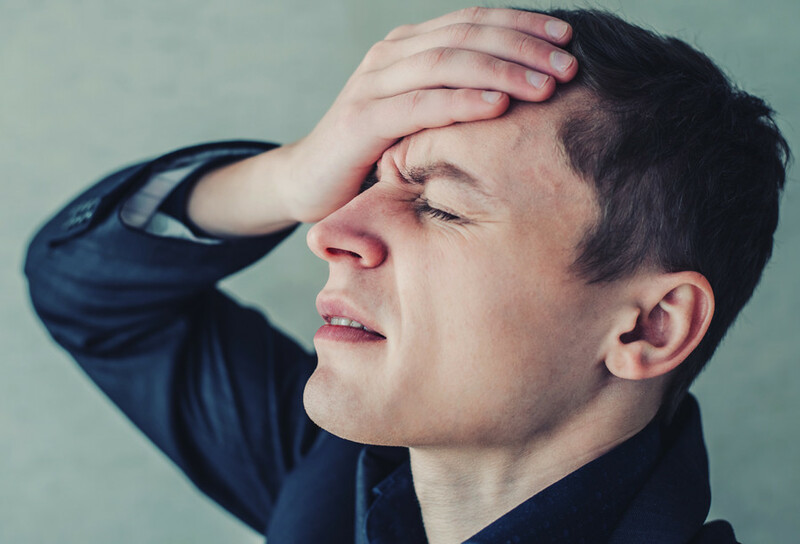 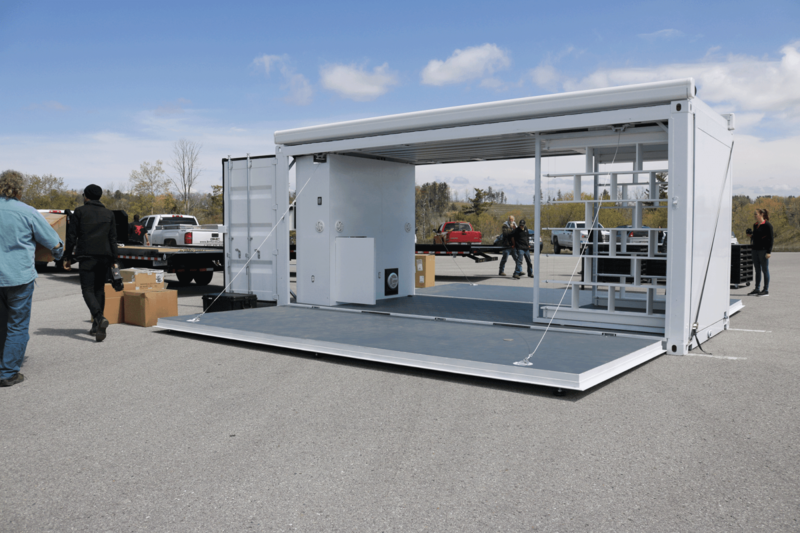 While Garage Flooring LLC does not approve this application as it does not meet the building code, many people will pick up VCT tile at their local building products store.